You begin your hunt for the great Sahasrahla by traveling westward and to the south, from the Sanctuary to the largest village in the land: Kakariko. Agahnim's soldiers stake out the streets night and day hoping to catch the boy who broke into the castle. The villagers have been warned to be on guard against him, but most are more fearful of the wrath of Agahnim than of the lad himself. Kakariko is a bustling village. Even though you're on the lam, be sure to stop by the various houses and shops several times to talk to people and pick up useful items. Most of the villagers will be kind to you. You will be able to find Bottles for carrying potions here, and one young boy will even give you his prized Bug-Catching Net. During your time in Kakariko watch out for women who patrol outside the north-west and north-eastern houses; they'll cry out if they see you and a soldier will attack. Blind the Thief leads his ruthless robbers on a crime spree, hitting houses clear across the country. His hideout is here in the village, but there are rumors that he has fled to parts unknown, leaving much of his treasure behind. According to legend, Blind hates bright light and left to seek refuge in the darkness. The upper floor of Blind the Thief's hideout is simply furnished and brightly lit. Villagers claim that Blind and his men worked by night, hauling in treasure and hiding it in the basement. Only a small part of his booty has been found since he left, so some think that he must have had another secret hiding place somewhere in the house. The crack in the basement wall looks mysterious. But in order to discover the secrets it holds, you need to locate some bombs. If you head to the north-west corner of the village, you'll notice a well placed precariously below a ledge. If you jump off the ledge, you'll fall down the well and into a cave. Inside the cave, you'll find a treasure chest that contains what will probably be your first set of bombs. Before you dash out of this cave to go and bomb the wall in the Thieves' Hideout basement, explore this cave a little bit. You'll notice a section of the north wall, near the other treasure chests, that looks a bit darker. 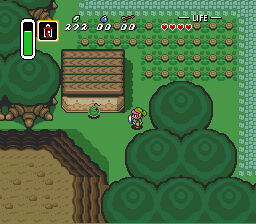 Plant a bomb in front of it, and it will break a hole in the wall that you can pass through. Do so, and you'll be handsomely rewarded with a Piece of Heart. Now make your way out of the cave and back to the Hideout. Head downstairs and you'll see the crack in the north wall, along with an interesting puzzle. First, place a bomb in front of the crack and stand back. Walk through the hole that it creates and help yourself to yet another Piece of Heart. 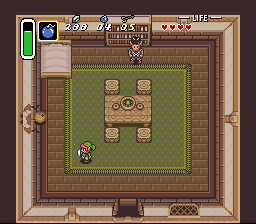 Back in the basement, every chest contains 20 rupees, but you'll have to figure out how to push the blocks so that you can access them from the front. If you make a mistake and need to start over, leave the room and return and the blocks will return to their original position. Sahasrahla, the village elder, is a descendant of the Hylian people who forged the Master Sword. When Agahnim began collecting victims, he disappeared from the village, and an old woman in his cottage worried about his fate. When you reach the X on your map, the woman will tell you that Sahasrahla has fled to some location. In order to find his whereabouts, you'll need to ask various people around the village. One way to make money is to sell animals to the Bottle Merchant. He pays hard cash for the fish from the Great Swamp, and for the Good Bee from the Ice Cave if you bring them to him. You have to drain the pond with the watergate, and carry the fish all the way to town. You will drop the fish when you are attacked, and you'll have to pick it up again. The Good Bee is easier to carry since you can store it in one of your bottles. If you happen by this home, enter it, and you will discover a child who is sick in bed. He seems to have caught an illness from the air coming down Death Mountain. Chat with him for a bit, and if you are in possession of a bottle, he will decide to loan you his Bug-catching Net. This is a very useful tool for catching things that have wings, be they simple insects such as bees, or more exotic creatures like fairies. However, you need something to keep your catches in before he will give the net to you. Fortunately, there is a bottle seller in town. He sits to the left of the weathercock, which is just below the Thieves' Hideout. His bottles won't be free like the net is, but for a mere 100 rupees, you can be the proud owner of a Bottle. 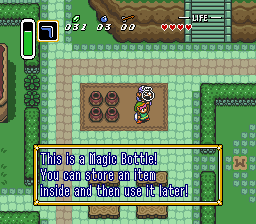 Now when you catch bees or fairies, you can store them inside the Bottle. You can also store various kinds of potions in them. Now be sure to visit the sick kid and borrow his net. While you're in the neighborhood, visit the house to the left of the sick kid's. At first glance, it appears to be occupied by nothing but chickens, known as Cuccos. However, a crack in the right wall indicated that you may be able to bomb it. If you do, you'll reveal a hole to a shed along side the house that contains arrows. The Blacksmith, who has a shop just east of Kakariko Village, is a very busy man. When his partner mysteriously disappeared, he was left the only Blacksmith in Hyrule. Now all of the sword tempering falls on him alone. Until his partner returns, he is sadly forced to turn business away. The well near the Blacksmith's house was a source of stories, not water. He fenced it off so curious children wouldn't fall in. A stake in the ground prevents you from accessing the ledge above the well. You won't be able to pass through until you have collected the Magic Hammer. Once you have it, you can pound the stake and jump into the well. There you will find a strange creature who claims to curse you for waking him up by taking away half of your magic power when, in fact, he accidentally doubles it. You may discover a house in which a portrait hangs on the wall. If you try pulling on it, four blue Rupee crystals will suddenly pop out for you to collect. One odd building in the corner of the village has no door and no windows. No one knows for certain who built it or what – if anything – is stored inside. The mystery cottage is the source of many stories and great speculation. If your curiosity gets the best of you, you can always try placing a bomb where you might expect to find a door. 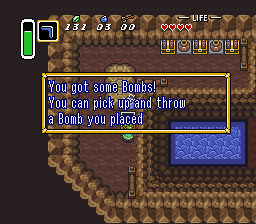 The bomb will make a hole in the wall, and you can step inside where you will find two rats, a few rupees under the pots, and four sets of bombs with which you replenish your bomb supply. In the Dark World, if you manage to explode the cracked wall you will find a chest containing 300 Rupees. Cuccos seem to be everywhere in Hyrule. Try as you might to make use of them, they won't talk or give you money. If you begin to attack one of the birds, hitting it over and over again with your sword, the Cucco will squawk so loudly that eventually a flock of irate fellow fowl will swoop down on you. Some creatures are better left alone. Villagers stock up on Hearts, Bombs, and Red Potion at the small shop in the southwest corner of town. It is always open, and its prices are fair. It is the only store in the area, so it also does good business with the travelers who happen by. More important than the shop itself, is a young boy in the shop's yard who looks after the Cuccos. If you speak with this boy, he will share the whereabouts of old Sahasrahla with you, and mark his current location on your map for you. Kakariko's Inn is known for its fine food and cozy atmosphere. It is open all hours, and there are usually a couple of regular customers hanging around in the lobby, ready to bend the ear of visitors from other parts of the land. It is a good place to meet people and hear the latest town gossip. One old man who often visits the Inn mourns his missing son. His absent-minded rambling however, seldom makes sense. 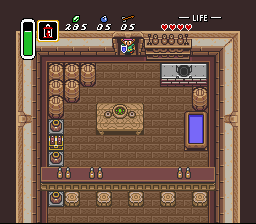 While visiting the Inn, you'll probably notice a treasure chest behind the bar, with no obvious way to reach it. You may be surprised to find out that this Inn has a back-entrance as well as a front. The Inn's back door leads to a room behind the bar that few visitors enter. It is used primarily as a pantry where supplies are stored. A quick glance in the chest will reveal yet another Bottle. As generations went by, the Hylian language changed. Stone tablets inscribed by early Hylians in their ancient tongue became unreadable for modern Hyruleans. Some Hylian descendants consult the Book of Mudora to translate the messages they find. South of Kakariko Village, you will find a storehouse of knowledge, the House of Books. It houses titles dating back to the beginning of Hylian civilization, and anyone wanting information about almost any subject can come here to learn. However, you will notice one particular book that you just can't reach. There may be a way to knock it down, but it looks like it's going to take a lot of force, like a running start. Remember to return here when you master the art of dashing. The rules say that you must go from the start to the finish in 15 seconds, but they don't say how you may do it. Anything goes in this game, and careful observers will notice a jump-off spot on the ground just south of the signpost, which you can use to hop the fence, saving precious seconds off your time. Southwest of Kakariko is the home of two brothers who argued so much that they finally sealed the door between their rooms. No one in all of Hyrulean history argued as much as the Quarreling Brothers do, and as is often the case with family feuds, no one really knows what started their argument. Unfortunately, because of the feud, none of the Villagers have been able to enjoy the 15-Second Game since it was the brother in the left room that ran it. By this time, you should have the tool you need to break the seal between the doors: a bomb. Blast a hole in the wall and wander over to the brother in the left room. Head outside, and you will be able to partake in the 15-Second Game yourself. The goal is to run from the starting location to the finish line in under 15 seconds. Should you succeed, you will receive one of the greatest treasures: A Piece of Heart. Along with the other two found in the village, and the one found in the The Lost Woods, that should make your next complete Heart Container. Gamblers try their luck in a small hut south of Kakariko Village. For 20 rupees, you can open one of three chests and take it contents. Luck runs strong in this gambling house. 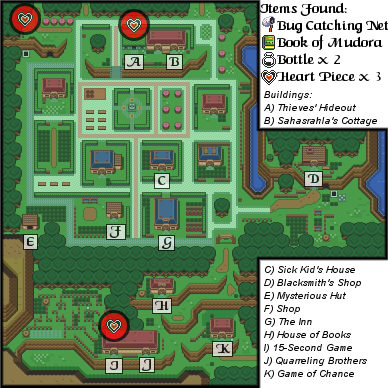 With your map updated by the boy next to the village shop, you must prepare to journey once more, this time to the very east of Hyrule. There are many paths to take, but the quickest one probably sends you right past your house along the way. Just exit south-east from the Game of Chance hut, and below the woods until you reach a cliff wall. Follow the wall north until it ends. Continue heading east, just below your home, until you reach the massive bridge that crosses a river. Head to the other side of the bridge, and follow the path that you will find traveling east. 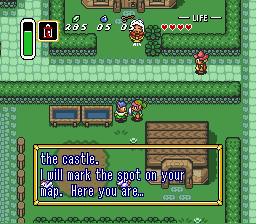 When you reach the end up the path by some trees, venture north to enter the region of the Eastern Palace. This page was last edited on 2 December 2014, at 17:48. This page has been accessed 151,792 times.